Wahoo it’s Wednesday! I feel like I haven’t been here for a few days. Mostly because the weekend didn’t have much to highlight, besides yummy food which I’ll share here today for What I Ate Wednesday along with what I meal prepped over the weekend. We usually enjoy at least one meal out on the weekends and I also have Tom home to help with cooking dinner, which gives me more time to focus on meal prep. 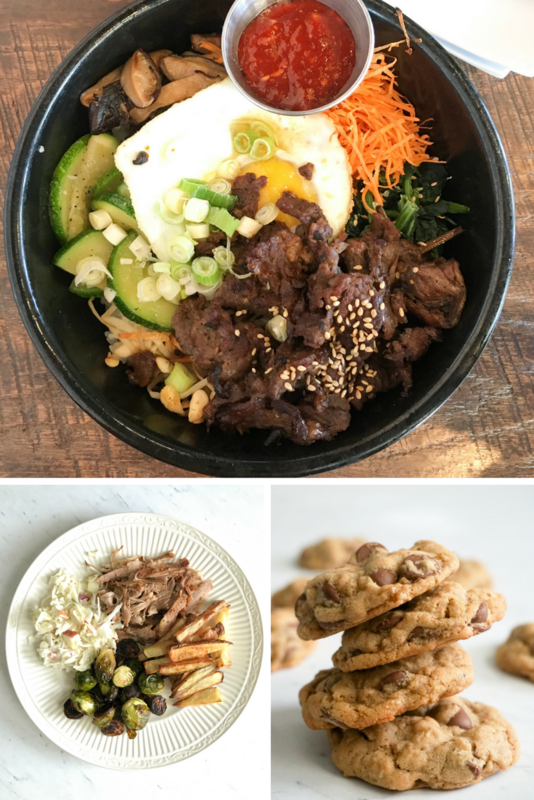 This past weekends foodie highlights were on Instagram, they include a lunch date to Spoons Korean BBQ for some Bibimpap with Bulgogi. So much happening in this amazing bowl and I love it! We also had smoked pulled pork Tom cooked all day, SO good, even though it takes almost 12 hours. And I handled the sides, my Greek Yogurt Apple Broccoli Slaw, roasted potatoes, and brussles. YUM! And of course some dessert. We loved these Peanut Butter Chocolate Chip Oatmeal Cookies, I was in a cookie choma by the end of the weekend. Now to the meal prep. It usually takes me about two hours on Sunday to get our weekly staples made and organized. And sometimes I finish lunch prepping by making something for dinner on Monday we can use as leftovers. The items that are made every week are usually protein bars or energy bites, hard boiled eggs, baked oatmeal, something for lunches, and roasted potatoes/veggies I use to pair with a lean protein for dinner throughout the week. 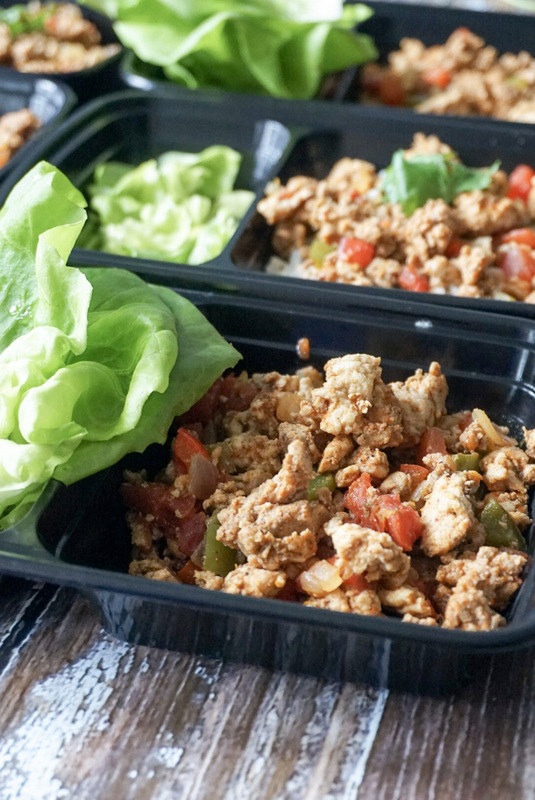 These Meal Prep Turkey Taco Bowls are one of my favorites to make for lunches. Everything can easily be made in one pan and you can easily customize the toppings and serve with a grain or keep it low carb with a lettuce wrap or salad. So many options! I start with chopping the veggies. 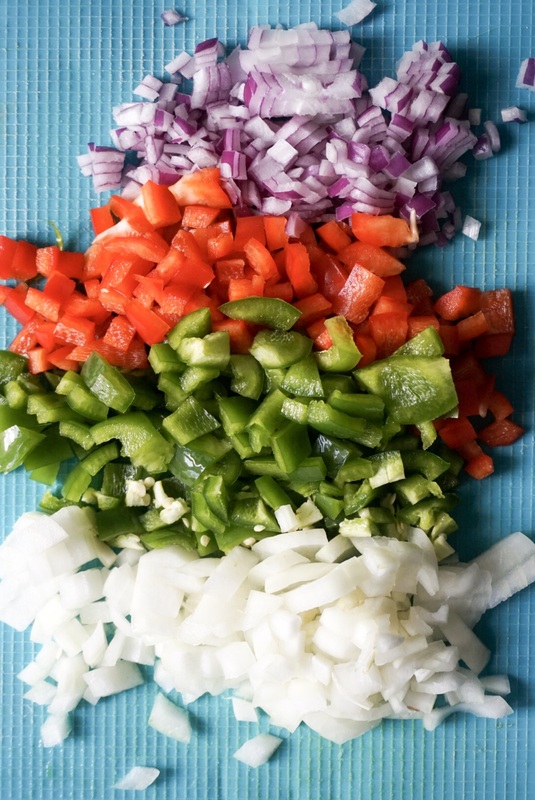 Of course use your favorite, I like onion, green and red peppers, and jalapeno. Then you’ll sauté the veggies for a few mintures before adding the lean protein. I used a mix of lean and extra lean ground turkey becauce I doubled the recipe for both Tom and myself to have enough lunches. Feel free to use ground chicken or lean grass-fed beef as well. 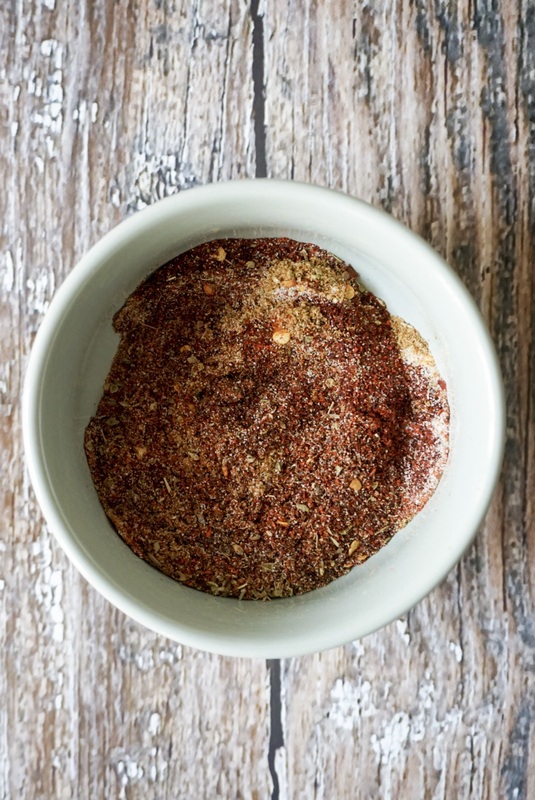 For the taco seasoning I make my own since I easily have all the spices handy, plus the packet seasonings are filled with sodium and artificial flavors and preservatives, yuck. Eat Real Food People! Then I add some diced tomatoes and let all the flavors cook together. You could always also add some black beans, corn, zucchini, etc for extra nutrients. I use these containers to organize my meal prep. Tom had some cilantro lime rice or tortillas with his. 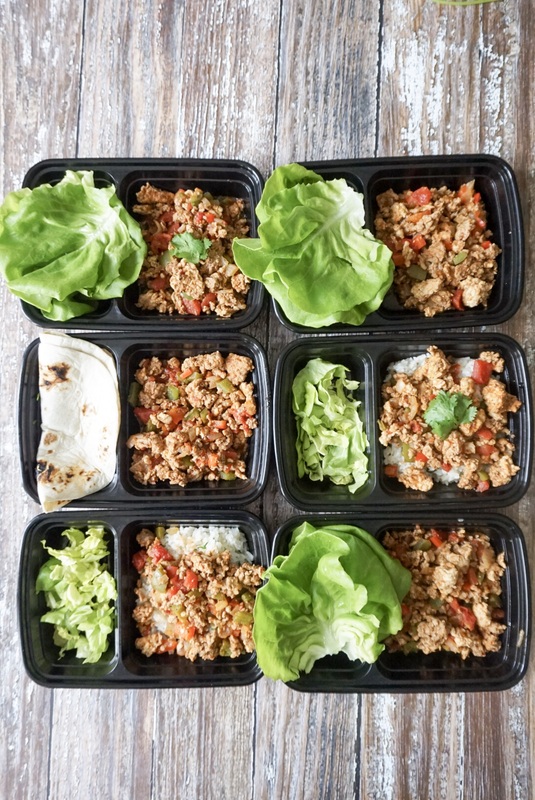 I made lettuce wraps with mine, and also used a Siete Almound Flour tortilla one day. Then the endless amount of toppings you could add to these Turkey Taco Bowls! I reccommend any combination of sliced avocado, cilantro, lime juice, lettuce, hot sauce, salsa, tomatoes, or queso fresco cheese. While I don’t always eat this way, but I wanted to keep my bowls “dairy-free” so after photos I added nutritional yeast for a littly cheesy flavor. In under 30 minutes I easily had several Meal Prep Turkey Taco Bowl lunches ready to go for a healthy work week. 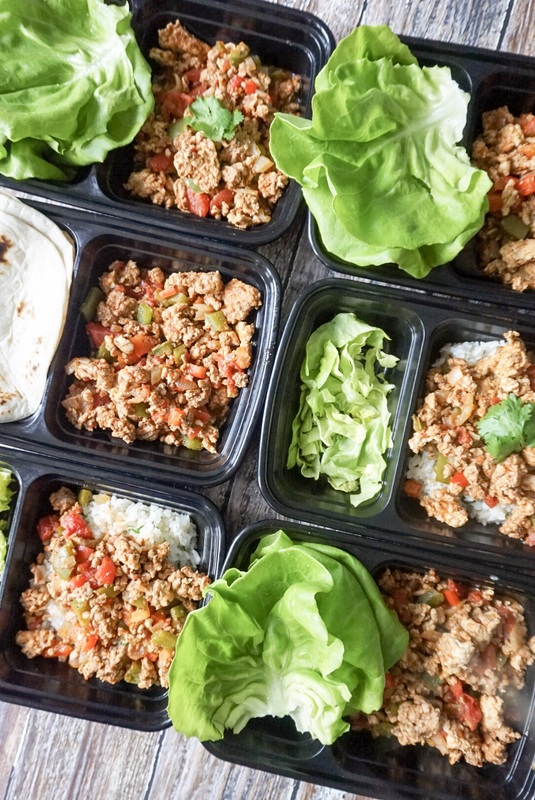 These Meal Prep Turkey Taco Bowls use lean protein, veggies, and all your favorite toppings for a healthy delicious lunch or dinner throughout the week. 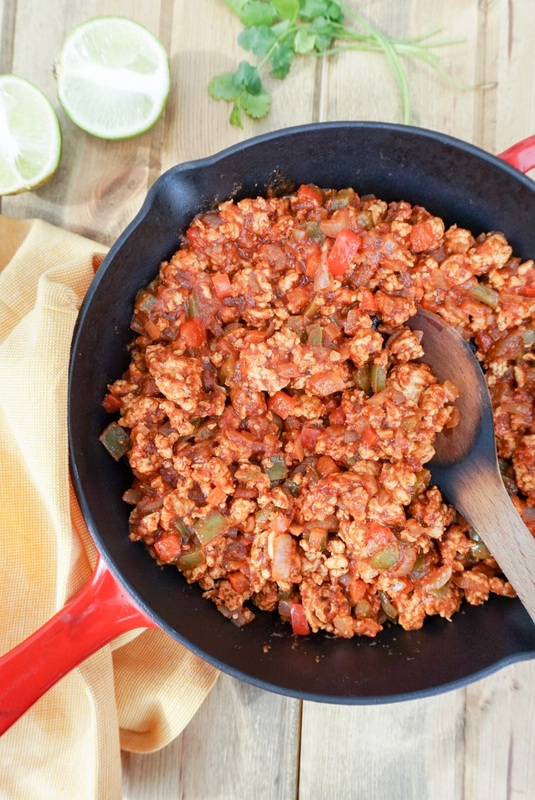 They can easily be made "paleo", "dairy free", gluten-free", and/or "Whole 30 Approved"
In a large skillet over meadium heat add the chopped red pepper, onion, and jalapeno. Cook for 3 minutes then add in the lean ground meat and cook until meat is browned and cooked through. Add the diced tomatoes and taco seasoning and stir to combine. Simmer uncovered for 5 minutes. Remove from heat and serve with rice, wraps, or lettuce. 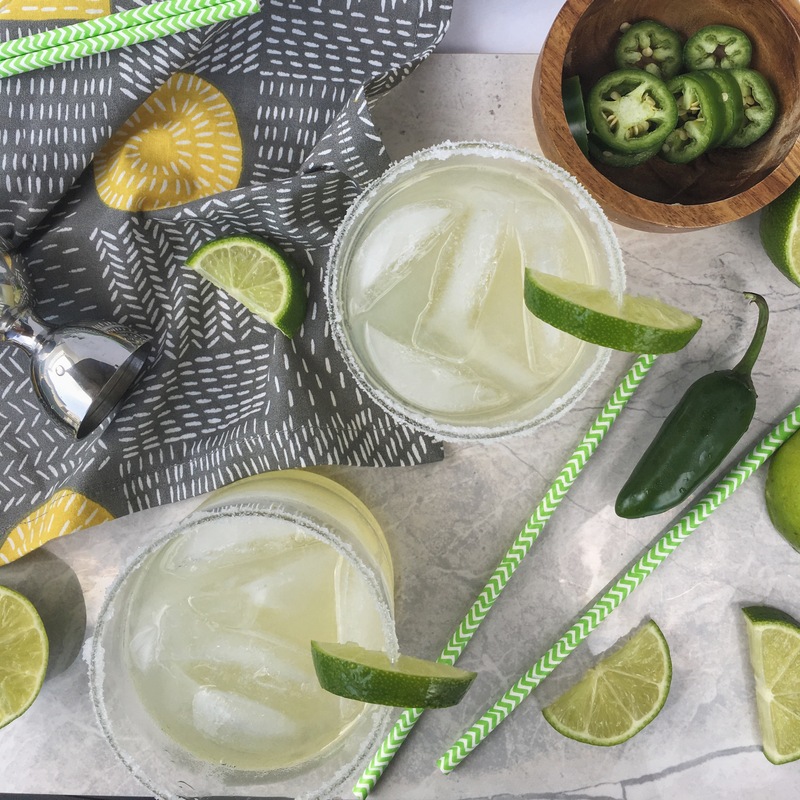 Optional but highly suggested toppings include: sliced avocado, cilantro, fresh lime juice, salsa, fresh tomato, cheese, or nutritional yeast. You can find other tasty healthy recipes here. What do you meal prep each week? 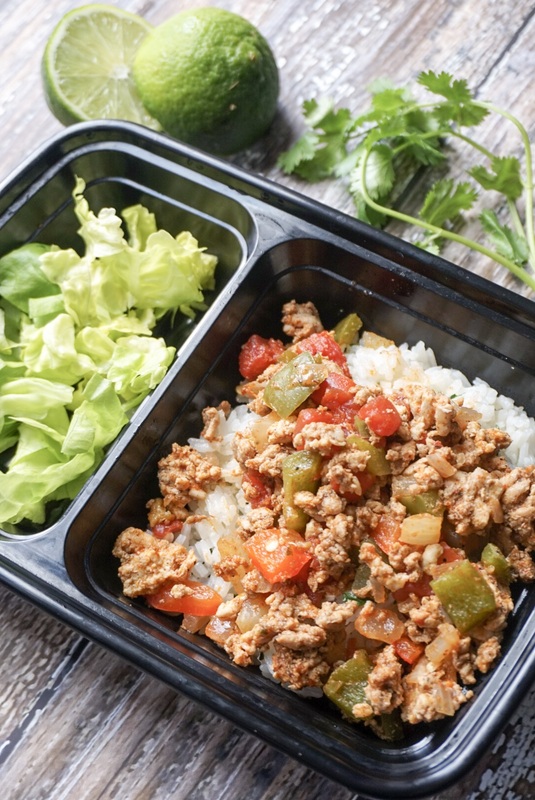 What toppings would you add to these Turkey Taco Bowls? How do you stay healthy during the work week? Each week I usually prep all my veggies & a lean protein & sweet potatoes or brown rice! That way when it comes to meal times I can just mix and match 🙂 This week I actually prepped ground turkey bowls too and have been adding nutritional yeast and salsa! Ah meal prep twins! And those are great staples. I love being able to mix and match meals throughout the week! These look tasty! I love taco anything. I am ALWAYS in the mood for anything taco! I meal prep each week mostly by just chopping up carrots for lunches at work. Since I cook for two, most of the recipes have leftovers which helps us as a way of meal prepping since I won’t cook every night. These turkey bowls look delicious and I would probably just want to add some homemade salsa to it. Mmmm homemade salsa is a great topping. And we use a lot of leftovers for meals too. It’s just the two of us too, I don’t know how large families do it! Making your own spice blends is way better! I agree. Taco bowls are perfect for meal prep. Right! I think some brands have gotten better, but since I’m always stocked with the spices I feel better making it myself. I love bowls like this! So easy to prep and change up the ingredients and flavors. I always prep an insane amount of hardboiled eggs and roasted squash. Mmmm I’ve been craving roasted squash now that it’s fall. Love easy prep meals like these! I typically prep hard boiled eggs and protein bars or pancakes every weekend. I would add cheese to these- yum! Those are all great items to meal prep. Pancakes are a great idea, I occasionally do those instead of oatmeal when I’m feeling something different. I have seen cauliflower tacos that look AMAZING! I made buffalo cauliflower once and loved it. And yea those cookies were so good, I definitely need to make another batch asap. Taco bowls are seriously one of my go-to meals. 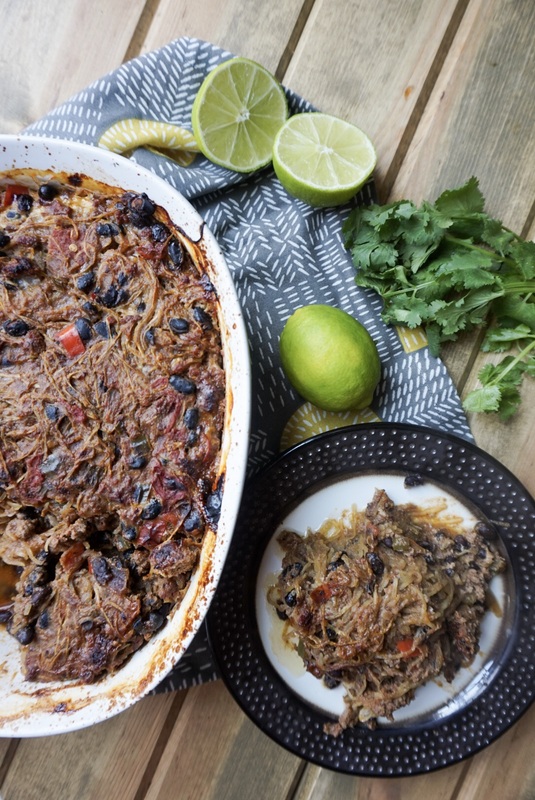 Whether I am using ground turkey or shredded chicken or even going meatless with black beans, I love them! Tacos anything is always my favorite. We used to make these bowls every Tuesday until I started using them for meal prep. I could definitely eat them twice a day though! When you said Eat Real Food People at first I read it as Eat Real People and I was like ack! Although I guess Halloween is coming up. Hahah that’s too funny. And I definitely MOVE in the kitchen and have a routine down. What great easy meals! Love how simple these are. You take such pretty pics too! Thanks Julie! And I’m all about simple meals during the work week. If I plan something too complicated it just stresses me out, lol.